The Scottish Parliament has never seen anything like it – more than 30,000 people queuing up outside and desperate to get in. Over three weeks they waited patiently for an hour or more just to see the Great Tapestry of Scotland. Bad news – it has closed at the Parliament. Good news – it is now back at Cockenzie House in East Lothian until December 8 and reviewed here in Lucinda Byatt’s splendid post. Lucinda and her mum were among the many stitchers. It will be back at Parliament next year. And if you want a preview, try the Tapestry website to see much better illustrations than mine here, listen to the audio, or buy the book. Best of all, just go and see it – take the kids and any auld yins too. Nothing quite crosses all generations like the tapestry. It’s wonderful day out and free to boot. Quite simply, it is magnificent in so many ways. Aesthetically, it is a stunning evocation of Scotland’s history, from earliest geological era to present day, told in more than 160 panels measuring 140 metres This makes it the world’s biggest tapestry (although, technically, like Bayeux it is actually embroidery). 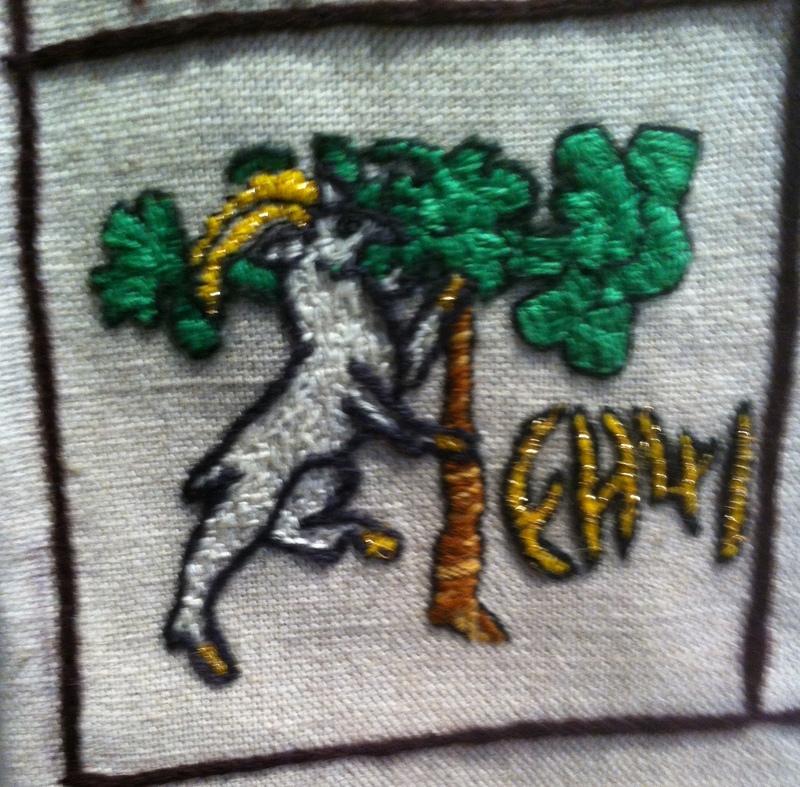 Its use of colour and various stitching techniques show how art as history. And history as art highlighting the various Scottish textile traditions from Paisley to Harris and the Borders to Shetland. Some bits you’ll know and others will surprise. David Hume and Jean Jacques Rousseau have books in their heads. 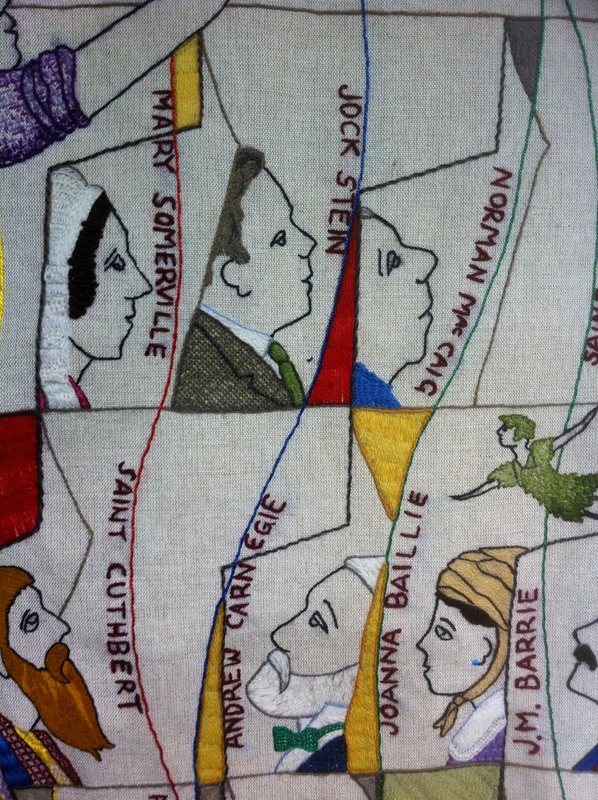 And Mary Somerville, founder of the Oxford college, is next to Jock Stein. 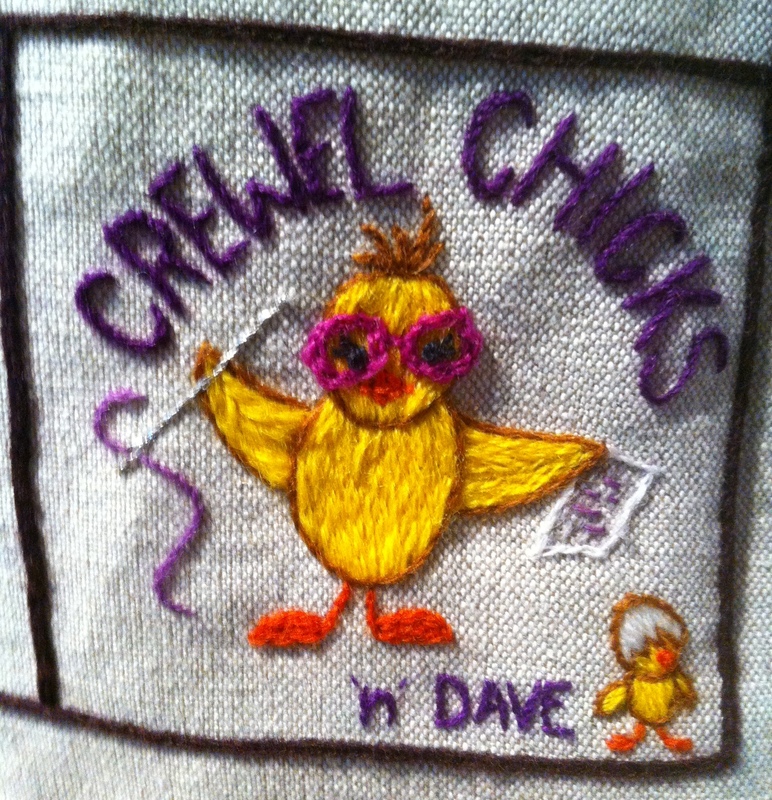 Clearly, the stitchers (more than 1000 of them) have had a lot of fun. They have left their mark in signature panels. It is a treasure trove of humour and hidden wit which stands out on closer inspection. And it is impossible to take it all in in just one visit – one lady came up five times from Peebles to see it. All of this came out of the Pans – the original inspiration being the Prestonpans tapestry celebrating the 1745 battle. 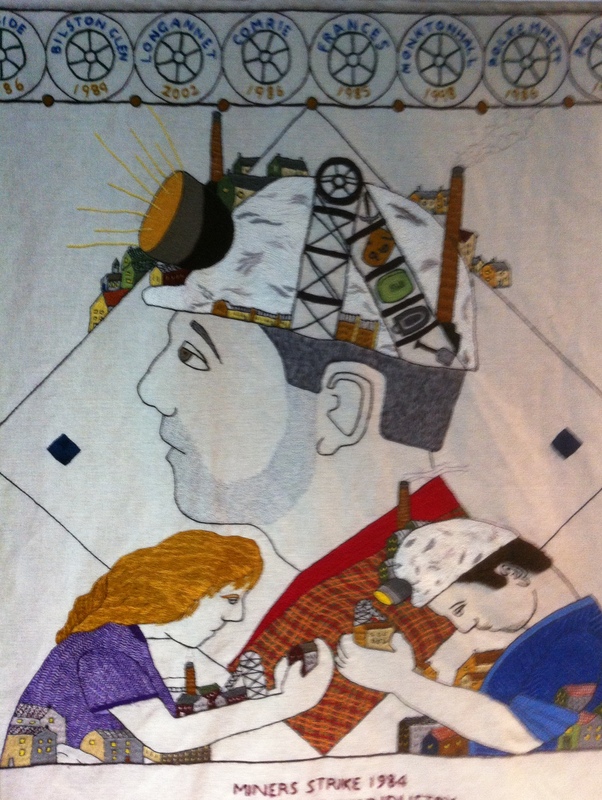 Artist Andrew Crummy designed the panels for that one, the Great Tapestry and the next one – the Diaspora Tapestry currentlyh being stitched by Scottish descendants around the world. 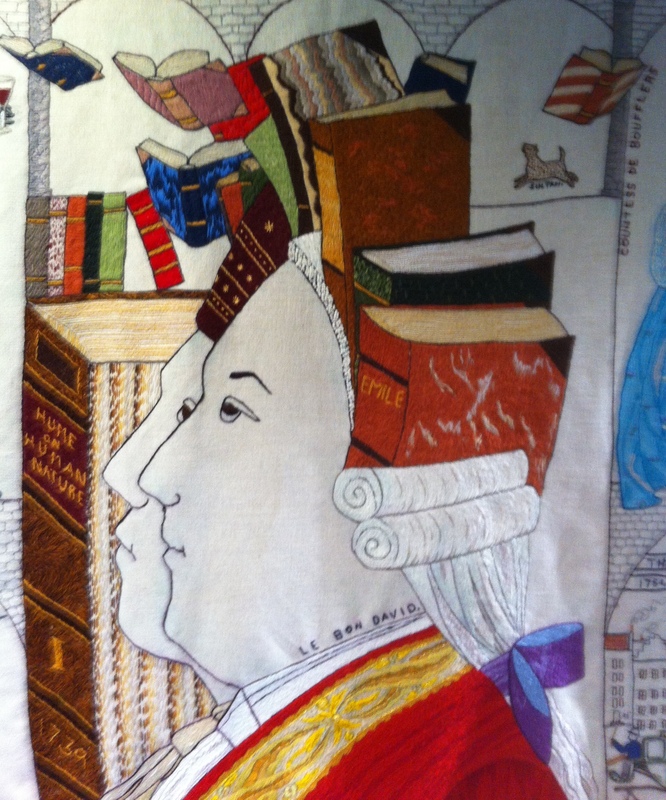 Sandy McCall Smith and Alistair Moffatt developed the Great Tapestry. Dorie Wilkie supervised stitching and Jim Naughtie is also a trustee but, sadly, my prediction about a panel for Aberdeen FC’s triumph 1983 at Gothenburg has not been realised. I suspect that Scotland going tapestry bonkers will trigger similar projects in other countries. This is a completely new slant on historiography – vast numbers of ordinary people coming together to weave – literally – their own history sparking new interest among young and old. 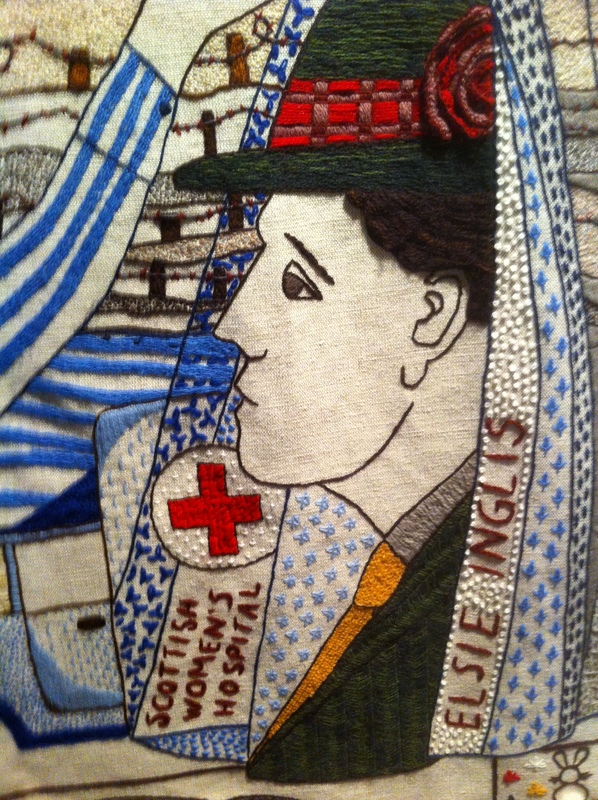 See it if you can – call it stitches in time or history knit large it is not to be missed.